I usually write my blog on Saturday night for Sunday readers. Last night was different. I couldn’t get home. I’d gone to a workshop with my friend Gail, in a town almost thirty miles away. It was an intimate gathering of five women and the facilitator, my acupuncturist and guru, David. We sat in the front room of a Wellness Center, small, charming, comfortable, and serene. The walls were lined with books and aromatic lotions. There was a lovely rug on the floor and comfortable chairs arranged in a semicircle. We were there to explore the Powers of Transformation. At the break, the Center treated us to a twenty-minute aquamassage – an amazing experience where, fully clothed, wearing earphones for music, and in a spaceship-like container, water (as in a water bed) undulates up and down your spine, neck, arms and legs. It’s soothing and hypnotic. All you want to do is stay there and sleep. At the end of the day, our little group had bonded. We’d shared secrets, made commitments to do good things for ourselves – adjust diets, exercise, and repair broken relationships, having learned about the powers of transformation. I dropped Gail off at her house and headed home. I was tired. The workshop had been cathartic, but emotionally charged. It was getting dark and cold. Meanwhile, back at home, my little town was hosting an Iron Man race. In streets normally quiet and empty, crowds of out-of-towners lined the streets, cheering the athletes (who were there from all over the United States) through fifteen hours of grueling paces – a triathlon of swimming in the river, biking over a hundred miles and running over 25 miles. The last lap was to run by my house, on my tiny little lane. I opened my house to my friend Missy and the family from Rochester, New York she was housing. Their daughter was in the race. At my house, they’d have a place to park close to the river and the last lap, and from time to time, they’d be able to come inside where it was warm. Missy made coffee and crab soup for them while they followed their daughter’s progress. I was glad to do it. After all, I’d be gone all day, and when I got back, it would be all over. The letter I’d gotten from the event planner said the last runner would be there at around 5:30. He neglected to tell us that that was their arrival time, and that the finish time would be when the last runner finished. The day that had started out so wonderfully turned into something else entirely. Before the day was over, I was angry. Fuming. I could barely make it through town to my street. Each intersection was a fifteen to twenty minute wait. When I finally got to my street, I found it blocked. Not even the policeman at the corner could get me through. Runners and cheerers were everywhere, tying up the street and the cross street in both directions. There was no space for a car to get through. The planners of this event had assumed the right to deny me access to my home. I made it back through the maze and down Route 50 to the Hyatt, sat in the darkened parking lot, plugged my cell phone (which was losing power) into the car battery, and started to make calls. Every room in every hotel, motel, and B&B in my town and the next town eleven miles away was booked. It was getting late and the wind began to blow. I called Missy. She was stuck, too. I couldn’t get in and she couldn’t get out. I asked her to feed my cat. I was tired, I was hungry, my bladder was threatening me, and I was overwhelmed with anger. I pay exorbitant taxes for my right to my street. And someone had arbitrarily taken it away. I felt powerless and filled with outrage. David had told us that what we’d learned that day would fade, that we’d had to go back and review it from time to time. I didn’t expect it to fade so quickly. As I rode around the perimeters of my town, unable to land anywhere, weakened by hunger and fatigue, the Power of the Shadow – something we’d discussed in the workshop – took hold. The Power of the Shadow represents our most primitive instincts. And I was there, in the middle of it. 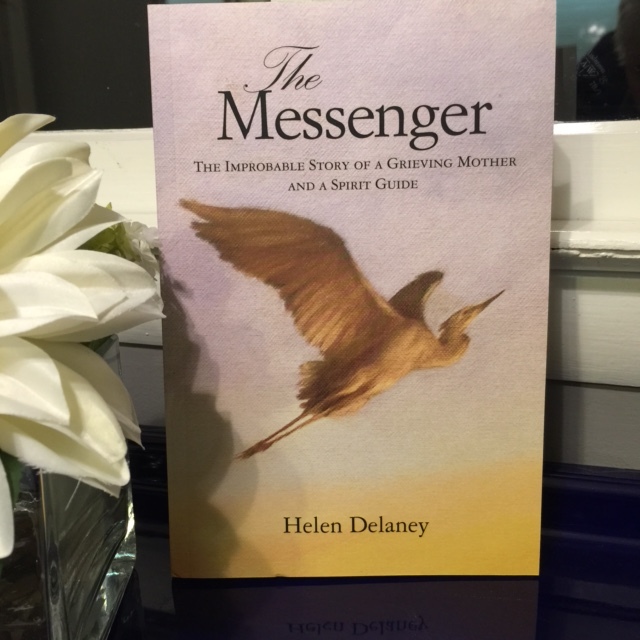 The Messenger: The Improbable Story of a Grieving Mother and a Spirit Guide by Helen Delaney is available at http://www.Amazon.com and at the News Center in Easton, MD.